I’m reaching out to all of you during the final days of the holiday scramble with a gentle reminder: it’s not too late to lower your expectations and enjoy the final days of 2017. Did you see the article I posted about how a friend of mine recently forwarded me an email from her son’s school about his classroom party? She wanted me to acknowledge (with a virtual fist bump) that instead of volunteering to bring a sweet treat or craft, she signed up for plates and napkins. Don’t get me wrong: my friend can bake and design the tastiest of treats (within the guidelines of approved classroom ingredients, of course). And I’m certain she would have found the top 10 Pinterest crafts kids go crazy for. But do you know what she values more than hours of baking and Pinterest-perfect craft preparing? Her time. She shed the should of proving to this second-grade classroom she’s boss. Why? Because she knows she’s boss. She’s mapped out her priorities and knows by saying yes to Pinterest, she’s saying no to board games and date night. And that, my friends, is a win. You can read the rest of this story, along with three tips I use to thrive during the holiday season here. One of the tips I wrote about is how it is ok to lower your expectations. I’ve been putting this into practice a lot lately. This past weekend my in-laws visited. A few years ago, I would have been “house guest ready”, the kitchen would have been stocked, the from-scratch muffins baked, the towels fluffed and placed in the guest room. This year I asked my mother-in-law to make her famous lasagna, we ate toast instead of freshly baked muffins, and they helped themselves to the towels. Lowering my expectations meant less anxiety and more quality time to focus on what mattered most: spending time together. I know some of you are tempted to ask “how can you be successful if you lower your expectations—isn’t that a sign of failure?” The short answer is no. The long answer is, it depends on how you define success. For me, I define success by feeling calm, not anxious. By being present, not rushed. By asking for help, instead of trying to do it all. When your mind is in a constant state of frenzy, you miss out on the experience you’re working so tirelessly to create. I encourage all of you to think about what expectations you’ve set that have sent you out of whack. What opportunities do you have to lower them? How can you redefine what success looks like to you these last few weeks of the year? How can you continue to lower expectations around the things that don’t matter, to focus on nailing the things that really do matter in 2018? Life can be complicated—sometimes at our own doing. As the year comes to an end, I encourage you to remember you control your destiny (and anxiety level). Right-size your expectations, and allow yourself to enjoy and celebrate all the good you did in 2017. Wishing you all the happiest holiday season and an incredible 2018. A friend of mine recently forwarded me an email from her son’s school about his classroom party. She wanted me to acknowledge (with a virtual fist bump) that instead of volunteering to bring a sweet treat or craft, she signed up for plates and napkins. Don’t get me wrong: my friend can bake and design the tastiest of treats (within the guidelines of approved classroom ingredients, of course). And I’m certain she would have found the top 10 Pinterest crafts kids go crazy for. But do you know what she values more than hours of baking and Pinterest-perfect craft preparing? Her time. She shed the should of proving to this second-grade classroom she’s boss. Why? Because she knows she’s boss. She’s mapped out her priorities and knows by saying yes to Pinterest, she’s saying no to board games and date night. And that, my friends, is a win. For those of you who value baking elaborate themed treats and coming up with the coolest crafts: That’s awesome. You should spend time on the things that bring you joy. I promise I’m not knocking those efforts. If I found joy in crafts I would certainly carve out time for them, but crafts make me cry (and have since I was a child—just ask my friends Brianna, Jamie, and Tara who crafted for me first grade through undergrad). So there you have it. I’ve got no time for crafts. What I do have time for is helping people gain clarity on what matters most to them, so that they may live their best lives. 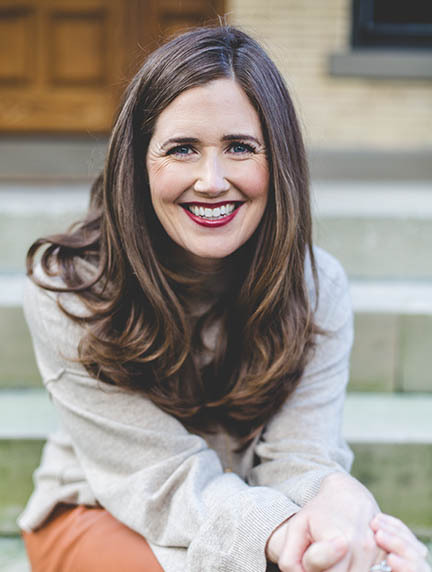 With the holiday season in full gear, I thought I’d share a few of my favorite tips for shedding the shoulds in hopes you can find clarity and enjoy more time doing the things you value most. My sister, Ann, is a whiz in the kitchen. I’m quite the opposite. When I open my cupboards, I see a trip to the grocery store, and she sees all it takes to prepare the finest of meals. What would take me weeks of mental energy (and loads of anxiety), she does in minutes (and it brings her joy!). What would take me the better part of a day to prepare takes her an hour. Spending time with my Ann is one of my favorite things, because her highest level of contribution is creating the best meals you’ve ever tasted—and my highest level of contribution is in the cleanup. Together, we are a great team. You’ll shine the brightest when you focus on your strengths and allow others to do the same. Figure out your highest level of contribution this season, and let others do the rest. What would it look like if you lowered your expectations? Over the summer I read a book in which the author writes about the stress she used to have preparing Christmas Eve dinner. Her kids never really appreciated the meal, and she missed out on the merriment because she was stuck in the kitchen. Her solution? She asked her kids what they’d really like for dinner. They wanted In and Out Burger. So now, that’s what they eat on Christmas Eve—on fine china. She gets to enjoy the merriment, the kids love the food, and they still all sit around the family table that feels special. I’m not suggesting we all eat fast food, but what if you had a potluck, bought a pie, or simplified one area of your holidays? Giving up some control over the holidays could yield some big gains in the form of memories with loved ones. Ask yourself if you had a blank slate, what would you create? See what bubbles up, and then figure out which ideas are possible to implement. Bottom line? Life can be complicated—sometimes at our own doing. As the holidays approach, I encourage you to remember you control your destiny (and anxiety level). 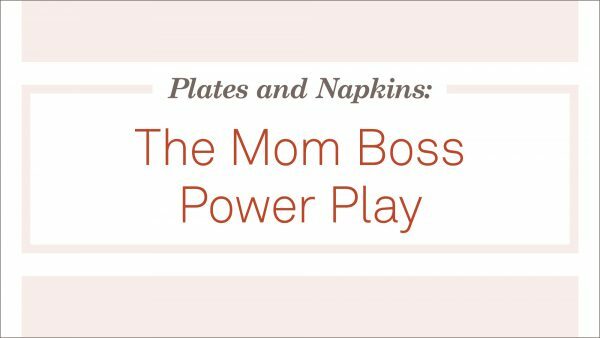 Find your plates and napkins moment. Seize it. And enjoy the benefits.